Hello Duelists! This week I'll be discussing things to be aware of when building your deck. There are many factors that affect what deck we ultimately choose to play, but more importantly, the cards we choose to include in them. Deciding on what deck to use is usually the easy part, because the best deck can just do more than all the other decks or do something better than the other decks. Building that deck to be better than everyone else's is the hard part. When building your deck the first thing you have to figure out is what the problems of the deck are, and whether those problems can be avoided. For example, back in September 2014 Patrick Hoban wrote an article on the problems with Shaddoll. The very next week he would go on to make the top 16 of YCS Toronto and win the draft portion of the event. He attributed his success to being able to fix the problems with the typical Shaddoll deck. This is probably the best starting point. After playing with your deck for a week or two you should start to notice that the games you're losing probably have something in common. For example, when I was using Qliphort at the beginning of Nekroz format (before the ban list) there were only 2 ways I would lose to Nekroz: I would either lose because Nekroz of Trishula resolved its effect or because Evilswarm Exciton Knight resolved its effect. So in order to solve that problem I added in more effect negation (sounds obvious enough, right?) I also thought it was obvious enough but I still saw many Qliphort players playing cards like Raigeki and multiple Spell/Trap removal cards. Qliphort didn't struggle with established boards or floodgates which means those cards did not need to be in your maindeck. If you’re playing the accepted best deck (Nekroz, at the moment) then you should be building your deck to beat the mirror match game 1, you should not be building your deck to beat rogue game 1. You have to build your deck to beat one, which usually means building to beat the mirror match when you're at a premier event. The primary argument against this that I've heard is "I don't want to lose to main decked Anti Spell Fragrance or Skill Drain or something similar." What you have to remember is that you're playing the better deck, which means that you'll beat the worse deck even having built your main deck for the better deck more times than you would beat the better deck having prepared for the worse deck. You'll have a better chance of winning games 2 and 3 against decks that aren't the mirror than you would winning games 2 and 3 against the mirror, since you're playing against worse decks. If you choose not to commit and main cards like Denko Sekka and Shared Ride you'll end up losing more often to both rogue and the mirror because you'll end up drawing the wrong cards against the wrong decks. 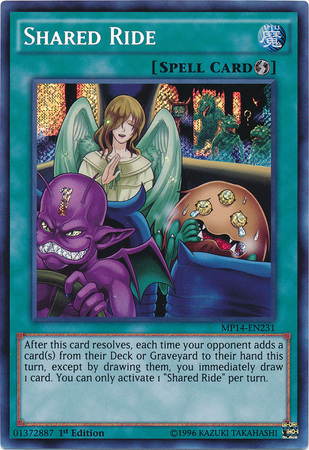 For example drawing Shared Ride against Shaddolls or drawing Denko Sekka against the mirror, these cards can have some minor utility but they probably won't. But let's say you choose not to play whatever the generally accepted best deck is because you feel another deck is the best deck. If you feel that whatever deck you're using is the best deck then based off that you should be assuming that you beat rogue, thus you should be building your deck to beat whatever the generally accepted best deck is. For example: Satellarknight this format. I chose to use Satellarknight at YCS Chicago and so did a good amount of others, because I felt it was the best deck (I was wrong). Leading up to the event a lot of my friends told me to not main the Anti Spell Fragrances that I was maining. I did not believe that to be a correct decision, their logic was Anti spell Fragrance is very mediocre against everything but Nekroz. But that was the whole reason I was maining them! Because every deck that wasn't Satellarknight I felt lost to Satellarknight (except Nekroz), I was going to make sure that I had very high chances of beating Nekroz game 1, because I was at a disadvantage game 2 and 3 when they had Denko Sekka and Royal Decree in their deck. Another thing I saw some Satellarknight players doing was maining 3 Mystical Space Typhoon. I definitely don't agree with this choice; the only deck you really want Mystical Space Typhoon against is rogue, but like I stated earlier, your deck should already beat rogue a majority of the time thus you should be maining to beat the best deck (Nekroz) and Mystical Space Typhoon is usually a blank when playing against them. Things get complicated when the “best” deck isn’t an overwhelming majority of the field (like Dragon Rulers were in their various formats). When this is the case, it’s entirely possible that an “anti-meta” strategy can be viable - Sam Pedigo’s success with Geargia at YCS Turin demonstrates this point quite well. However, in our current format, Nekroz doesn’t even make up half the field. Sure, it’s far and away the most populous deck in the top cut of any event, but in NA, you’re only playing one constructed round in top cut! (Or at least were, since YCS Columbus will not have a draft portion). Most of your rounds are in swiss, so if you’re trying to build an anti-meta strategy, you’re going to have to take into account the fact that you’re going to see a lot of other decks before reaching the top tables. That's all for this week's article! Do you guys think Nekroz are still the best deck? If you'd like to see me write about a certain topic feel free to message me on Facebook. The Circuit Series stops by Richmond, VA next on May 2-3! And As Always Play Hard or Go Home!